It is not uncommon for people to die in their sleep. As horrible as it sounds, it may seem a welcome reprieve for some rather than to die a tragic death from a terrible accident or suffer long from a debilitating and painful medical condition. Of course, dying in your sleep seems like rather smooth and easy but if you still want more in life, the last thing you want to happen to you is to no longer wake up the next day. People slip off of life in their slumber for several reasons. Some suffer from a fatal heart attack or a stroke while for some, it can be a sleeping disorder. Sleep apnea is a common condition affecting millions of Americans today. It is no longer a funny case of how we view it decades ago when we joke around our snoring sleeping uncles. Sleep apnea can kill you and it is not just from the loud and annoying snoring sound patients with sleep apnea make but more so because of the deadly breathing gaps while they are asleep. When you have sleep apnea, your brain essentially has to constantly decide whether to breathe or sleep during your slumber. It is such a scary thought that you are basically in a 50/50 situation while sleeping; there are those multiple breathing gaps you make each night. Aside from that, the very nature of the condition consequently deprives the brain and other vital organs like the heart of oxygen, so it predisposes you to deadly conditions like stroke or a heart attack, the perfect recipe for death in your sleep. Josephson adds that sleep apnea can also wreak havoc with romantic relationships and is a leading medical cause of separation and divorce. Snoring is often the main symptom of sleep apnea aside from seeing sleeping people first-hand that isn’t breathing or gasping for their breath although not all snorers have sleep apnea. It is why you should always get yourself checked for any symptom you may have as what you are thinking it may be isn’t always true. Only proper assessment by a medical professional or a specialist doctor can pinpoint the exact problem and offer helpful solutions to manage your disease or condition. And there’s no reason to fret either as surgery isn’t always advised if it can be helped by other medical interventions. 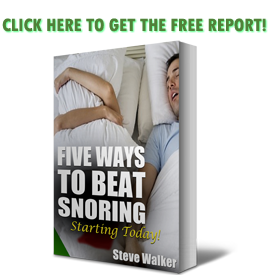 Snoring can be caused by allergies, obesity, genetics, and even muscle-relaxing medications. But it can also be a symptom of sleep apnea, a condition where people stop breathing for short periods of time while sleeping. As if that isn’t concerning enough, the American Heart Association cautions that sleep apnea is associated with hypertension, stroke, and heart failure—and studies around the country can confirm. University of Wisconsin-Madison researchers found that over the course of an 18-year study, people with severe, untreated sleep apnea had triple the death rate of those without apnea. For participants who had 30 or more breathing pauses per hour asleep, their risk of cardiovascular death was five times greater compared to those who had fewer than five pauses. In a different study from the American Academy of Sleep Medicine, people with moderate to severe obstructive sleep apnea (the most common form of the condition) were four times more likely to die and three times more likely to die from cancer. They also more than doubled their risk of developing cancer and were nearly four times more likely to have a stroke. It does not always have to be instant death, though. Again, the constant oxygen deprivation can mess with your health and trigger major organs to falter over time. Yet since we are already living in modern times, you don’t necessarily have to suffer from sleep apnea anymore or even worse, die from it. There are all sorts of technology available that can help you get through the night without literally putting one of your feet on the grave. If you suffer from sleep apnea, you can likewise save your partner from sleepless nights so they can finally have their beauty rest and not endanger their help from sleeplessness. CPAP, although the best method for managing sleep apnea, isn’t always the most comfortable. Here is why CPAP isn’t popular with sleep apnea patients https://snoringmouthpiecereview.org/why-a-cpap-machine-is-probably-not-for-you. Don’t fret because you have an excellent alternative. https://snoringmouthpiecereview.org/snorerx may be the one you are looking for. It’s easy to use and help correct those anatomical anomalies that put you at risk of sleep apnea in the first place.